Sail through the crystal clear water of our magnificent lagoon in direction of the enchanting island Ile aux Cerfs and GRSE Waterfall. We shall sail to Ile aux Cerfs, one of the largest island of the Mauritian territory which offers you a wealth of preciously preserved nature and an imposing and magnificent landscape. You will discover one of our most renowned waterfall at Grand River South East. Its rich flaura and fauna will enable you to observe the bats hanging from the tops of the branches and monkeys in their natural habitat perched on trees or sheltered on mountain slopes that border the river and the majestic Pailles en Queue. 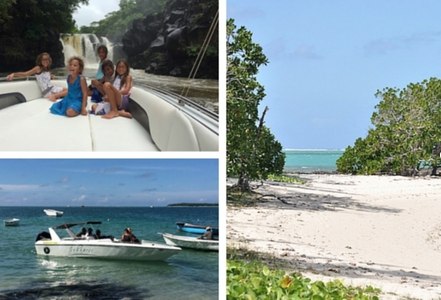 This speedboat trip will provide you with a day full of fun discovering the beautiful Eastern part of the island. At the start of the journey our staff will welcome you and there shall be a briefing about the few security measures to be taken to make the most of this promising journey. We shall head towards one of the largest islands of the Mauritian territory namely Ile aux Cerfs. The island famous for its sandy beaches and beautiful lagoon, will provide you with a pure moment of relaxation on a picture-postcard beach. We shall sail away in direction of Grande Riviere Sud Est, the longest river of the island. You will be amazed by the beautiful scenery of our mountain chains surrounding the island while sailing on our exquisite turquoise blue lagoon. The river flows 30 km along the Bambou mountain chain before it empties itself through a magnificent waterfall in the Baie de L’Anse Cunat, which you will be able to admire. This place offers a pure moment of relaxation and breathtaking views in the arm of Mother Nature. If you want more fun there is a big selection of activities along certain parts of Ile aux Cerfs such as snorkeling, water skiing, banana, glass bottom boats and more.